In watching the television the other night, my eye caught on an advertisement for the new iPad2. Said to be both 33% thinner and 15% lighter, this new design to the original iPad hopes to attract more buyers for the product. At a first glance, this product means absolutely nothing to me. I have hit a point in my technology skills that my brain is having trouble computing the idea of a new gadget to learn. I have been happy for so long having the freedom to use my trusty laptop wherever I go, that the concept of trying to sort out why I would “need” to get something such as an iPad seems incredibly absurd. The reality of it is, as time goes on, the popularity of this new flash gadget is increasing with each day. I have started to spot people using them at the local cafés to read books (what happened to the good old-fashioned feel of a paperback?) or amongst friends on public transport as they show off their newest travel photos. In reading up on this new iPad2, I was surprised to find that one can even doing things such as listen to music video conference (with two videos) and do all the things one can do on a laptop without the need for a keyboard or mouse. The possibilities are endless. So naturally, the debate for the iPad has come down to those who prefer the feel of a real book at their fingertips and those who like the idea of loading an entire library of reading material on one small device. It’s a tough call and I personally am not sure there is a specific “right” answer. By upgrading to the iPad a person can potentially help the environment (think of all those forests depleted of their resources around the world) by having their reading materials all within reach of one small piece of equipment. Limiting the trees needing to be cut down to print books can only be good, right? One media company, Reed Elsevier, actually took it upon themselves to look at the environmental impact their business had when comparing their printed work to the online publication. They discovered that there was a significant positive impact on the environment when pursuing the development of their online publication (thereby decreasing their carbon footprint based on CO2 emissions and such), but pointed out that if an online user “was going to spend more than 40 minutes online (35 tons/C02) it would be better for them to print an article (30 tons/C02)” (Balisciano, Dr. Marcia, 2009). This relates quite significantly to something like the iPad2 that advertises itself for an alternative reading device. Initially the marketers of the iPad were aiming to target students of universities that may welcome an alternative to purchasing and carrying around multiple large and heavy textbooks. Edward A Blake (Marketing Manager for Book Boon) stated that, “At first glance, the iPad does look like a real game-changer for us in the publishing industry and so we were all expecting the response to be 99% positive. Instead, what we actually received was an awful lot of negative feedback towards using the iPad for studying – much of it supported by very strong arguments” (Blake, Edward A, 2010). Arguments varied by students pointing out that it’s one thing to read a novel in the comfort of your home before going to sleep in comparison to trying go through endless textbook chapters in the school’s library. Students also stated that things such as the iPad are forbidden in exam rooms where as textbooks are allowed. To top it off, an iPad is more likely to get stolen than a heavy textbook on Quantum of Physics. So perhaps it’s all a matter of opinion. Apple has worked hard to ensure that the product they have created is as environmentally friendly as possible. Online there is a publically accessible environmental report for the iPad2, describing the efforts Apple has gone through to make as little impact on the environment as possible. 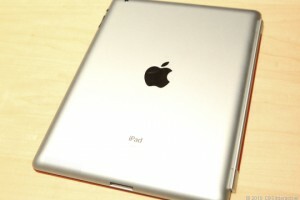 “iPad 2 uses power-efficient components and software that intelligently manages power consumption. In addition, the iPad 10W USB Power Adapter outperforms the stringent requirements of the ENERGY STAR specification for external power supplies” (Apple Inc, 2011). The packaging that the iPad2 comes in is made of recyclable material and “Apple’s ultracompact product and packaging designs lead the industry in material efficiency. Reducing the material footprint of a product helps maximize shipping efficiency. It also helps reduce energy consumed during production and material waste generated at the end of the product’s life. iPad is made of aluminum and other materials highly desired by recyclers. In addition, iPad2 is even more material efficient than the original iPad, consuming up to 18 percent less material” (Apple Inc, 2011). As a result, when a consumer is finished with the iPad2, the entire product can be recycled. To top it off, the iPad2 includes a mercury-free LED-backlit display, arsenic-free display glass, is brominated flame retardant (BFR)-free and polyvinyl chloride (PVC)-free. Maybe it’s not such an issue of whether one prefers to be up on the latest technology. Maybe it’s not a matter of whether one needs to decide whether they prefer books or online publications. Maybe it’s more a matter of simply being more aware of how each day choices affect the world we live in different ways. By taking on the new technology of the iPad, one can be assured they have purchased something of which Apple has taken some initiative to make as environmentally friendly as possible. But take care – an iPad2 does not solve all the world’s problems in one fail swoop. Make the effort to recycle (if possible) discarded technology gadgets no longer wanted. Take note that it may be a better choice to actually have something in print to read at your leisure than to be reading it online for hours upon hours. But most importantly know that just because iPad2 ticks a lot of the boxes now, there will always be something faster, lighter, most advanced and better overall. Gone are the times of which we can simply read one article of fact and call it true to all situations and circumstances. It is up to us to look at our lives and how we live them to decide what is right for us. There is no one right answer, no one way for all of us to go. As new technology appears with a better awareness of the impact it has on the environment and a plan to minimize such impact it is up to us to weigh the pros and cons and make our own decision.